Some newer art of my character. 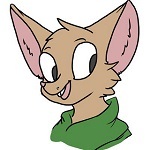 I realize I haven't posted on here in a long time, and I honestly don't even remember if I posted pictures of my current fursona. Kayko hadn't grown up with the idea of being a macro himself. And in fact he only discovered his growth powers one day when he was 18, after a particularly emotional nightmare triggered the growth. At the time he was already living on the outskirts of the city, so fortunately the only damage was to his own home(which was an empty house he'd be squatting in anyway). Unfortunately for the hybrid, however, he soon attracted the attention of hundreds of onlookers and was forced to flee the city. He hid in the country for a bit of time after that, trying to escape the world and isolate himself. Haha, I have the tendency to accidentally break things in real life. So this is kind of an expression of that on a much larger scale.